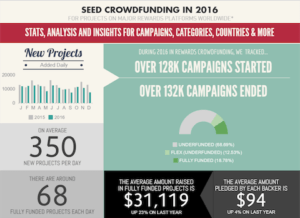 January 25, 2017 — Seed-Crowdfunding provided 40% more funding to UK businesses and startups in 2016 than the government funded Startup Loans program. According to a report by The Crowd Data Center, which has collected extensive data on 500,000 crowdfunds, this newer source of business funding is now rivalling banks, lending, angels and equity as a better way to fund new businesses, products and services, not to mention jobs and growth. And it does so without placing a debt burden on businesses and startups. The report has been welcomed by Barry Sheerman MP, who says this finding has profound implications for UK businesses, entrepreneurs and government. 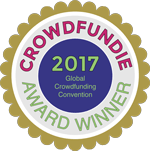 “We have defined ‘Seed-Crowdfunding’ as the use of ‘rewards based” platforms to fund the creation of new businesses, products and services” said Barry James, CEO of The Crowd Data Center. “Until now, ‘rewards crowdfunding’ as it’s often known has been mostly associated with charitable and community funding. “Now we have the full 2016 data this makes possible a direct comparison with Startup-Loans revealing that businesses are being better funded, and at a lower risk to all involved. Barry Sheerman MP commented: “I chair the all-party parliamentary group which has supported the development of crowdfunding through it’s early stages and so I can tell you that the 2016 data and this finding provide a very significant milestone with profound implications for UK businesses, entrepreneurs and government. Kerrie Dorman is founder of the Association of Business Mentors. She said credible business mentors should be in the know regarding raising finance via Seed-Crowdfunding. The Crowd Data Center is the world’s observatory on the crowd economy and collecting data from across the world on thousands of live crowdfunds each day. Is your team on fire? What is the power of Love?